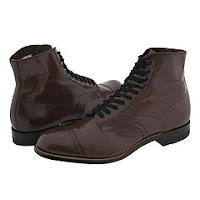 Stacy Adams Madison classic retro-style boots have the extraordinary benefit of looking smart with any type of outfit. They go pretty well with a pair of jeans or with a classic suit. You can also match them with a leather jacket and Johnny Depp style hat. The boots have six eyelets and four hook for the contrasting black laces.